Our estate-grown wines embody the vibrant charm and complexity of our historic Los Carneros vineyard, exhibiting the balance and elegance indicative of this unique terroir. The Estate Chardonnay is brimming with stone fruit, white blossoms and lovely notes of vanilla and clove. 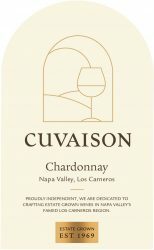 A gorgeous vintage in Napa Valley, the wine is quite opulent, with a plush texture buoyed by white peach and honeysuckle notes. Despite its apparent richness, the wine has the trademark focus and lingering finish that our Los Carneros estate is prized for.